Rwanda 94 is a limited edition release that is “an attempt at symbolic reparation to the dead, for use by the living.” It is an artistic testimony to the genocide of the Tutsi and the massacre of the Hutu opposition in Rwanda in 1994. Rwanda 94 is a five-and-a-half-hour play that resulted from a four year collaboration between Western and Rwandan artists. The story of Rwanda is so complicated that the authors used different forms to tell it: monolog, oratorio, and an hour-long lecture on the historical roots of the genocide. This release is an edited down version that contains the music and a 270-page book with photos and lyrics in both French and English. Mixing elements of African music with Western music, they have achieved a mournful aspect that conveys the horror of genocide and also some lighthearted French jazz. As the music is sung in French, the emotional impact is somewhat lessened for us English speakers. This play has been performed to sold-out audiences across Europe and Canada. Rwanda 94, to be fully appreciated, must be listened to carefully and should not be considered background music, simply because of its message. One difficulty for the listener in navigating this monumental work is that it does not contain a track listing for the two CDs. The listener has to laboriously work his or her way through the libretto to locate a specific track. 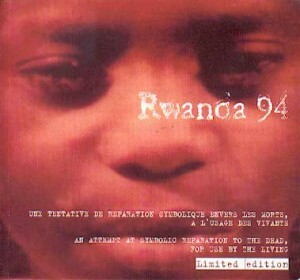 Rwanda 94 is not for everyone, but should be considered by Human Rights proponents around the world.